The Marwar Festival injects a new spirit of liveliness into the lives of the people of Rajasthan. This festival is held in Jodhpur during the month of September-October. The festival is celebrated during the full moon of Sharad Purnima in the month of Aswin. 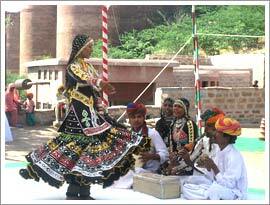 The festival showcases the rich art and culture of Marwar region, Rajasthan. Earlier this festival was known as Maand Festival. It is celebrated in the honor of local heroes of Rajasthan. Dance and music are chosen as the media through which the tales of yore are retold in a creative way. Such tales pick up the themes of heroism and battle. Skilled women dancers balance several pots on their head. The songs and instrumental music played by professional singers to accompany this dance have a distinct flavor to them. They find their way into your heart very easily. The magnificent Umaid Bhawan Palace, Mandore and Meharangarh Fort serve as the royal venue for the festival. Camel polo and camel tattoo show are the cultural activities enjoyed by one and all in this fair. It is a great opportunity for tourists to get a glimpse of the rural life of the state.